Fed up with those annoying unexpected program crashes? 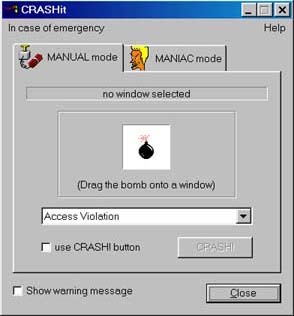 Use CRASHit - and YOU decide when your programs will crash! you've been working on this really important document the whole day. Now all you can do is click that OK button and cry into your mousepad. But don't worry, you've just found the solution! CRASHit gives you back the control. trembling in fear of the next crash. (On the other hand, many users feel that the latest Windows versions are too stable. click here to download this MUST HAVE PowerTool. click here to visit the RUNit homepage.